Anne Morse Hambrock sent out a note over the weekend about the Kenosha Festival Of Cartooning. It had a lot of good updates about upcoming guests and such, but one point she noted as well was that, after this year, the convention will be on hiatus until 2019. She cited a few reasons, the primary two seemingly that she wanted to keep the event infrequent enough to encourage people's excitement around attending and to avoid the possibility of "donation fatigue" among patrons. That last bit caught my attention because I hadn't really thought about that angle before. 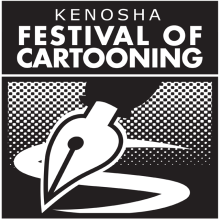 The Kenosha Festival Of Cartooning is free to attend. Most conventions and shows have some kind of entrance fee, and that money goes toward renting facilities and paying guests and all sorts of practical aspects of running a convention. Those smaller conventions that are sprouting up at libraries are usually free to attend as well, but the costs come out of the library operating budgets, often funded by tax dollars. So how do they pay for the Kenosha Festival? The donation fatigue comment suggests they rely heavily on that. Well, I knew they had set up an IndieGoGo campaign a while back. But that's over now, and didn't seem to raise nearly enough to cover all the costs they must incur. And that campaign was also considerably more recent than the festival has been running. Also, there aren't any vendors at this festival that might have to pay for table or booth space. Despite some superficial similarities to a 'typical' comic convention, there's clearly a different setup here. So where does the funding come from? I talked briefly with Morse Hambrock about exactly this. They do have some corporate type sponsors -- cartoon syndicates and some newspapers primarily -- but the vast majority of their money comes from donors like you and me. Individuals who throw in whatever extra cash they can afford. Maybe $20, maybe $200. But by and large, it's not these huge donors dropping piles of cash. Just a bunch of people who think comic strips are cool and deserve to be celebrated. I don't know exactly how often the donation button on their site is clicked, but that's essentially where the funding comes from.